“We got to get there for 8am, it says so on the ticket and I don’t want to be left behind,” were the words that came from my sister as she rang down the bell that morning. At 7.55am it was doubtful that we’d make it for that time, but I figured that black people being black people, this coach was definitely not leaving on time. We eventually arrived at 8.30am at the designated meeting point that morning, the Metronomes mas camp in Ladbroke Grove .. and no the coach had not arrived yet. Our ticket price had actually included breakfast and was treated to saltfish and dumplings at the Metronomes camp,to line the stomachs. The majority dutifully ate, as we all had started to drink already and as the coach arrived around 10am, we all boarded ready for Bournemouth. We were actually booked to go in one of 14 coaches going to Bournemouth that day for its annual beach lime and as I had been once before, I was excited to go again; but now with my grandson and family. This event has garnered a loyal following over the years and has increased, as such, that the group literally take over a good section of the beach. With our brash wear, loud music and food smells, we can pull in the locals into liming with us. We don’t have normal coach trips do we? Safety rules and seat belts – what are they? I don’t mean to be the killjoy, but it is so dangerous with our need to lime. Just to stand and hang out, literally anywhere. Even on the coach, we are liming and feting with a complete disregard for safety. Just a little bit of soca is all that is needed and we are up and having a fete, anywhere we are. However, as much as the need is to fete we should not disregard the paramount of safety. The coach did have a good mix of people, old and young; all with the intention of having a good time. Like with all good coach trips, alcohol was available and served early and as any self-respecting feter knows, there are no time boundaries to start drinking. Suffice to say as the coach departed, the party began. Once we arrived in Bournemouth, albeit slightly later than advertised, at around 12.30pm. We then promptly made our way to where everything was being set up. I feel that it is important to note that, it was quite a long walk along the promenade to get to our spot, so don’t go walking with heels and nuff bags to carry! If your a first timer you have to get to grips with what you need to bring to these beach limes, for these are no ordinary limes. People bring chairs, tables, dominoes, cards, blankets, cooler boxes, tents, marquees and an abundance of food. It is reminiscent of one of those of those old skool events when growing up, where entire families and friends went to places like Bognor Regis beach. From the squeals of delight on children’s faces to the older generation hobbling their way down the promenade to be part of this showed me that times had not changed and I liked it. At the very least, you need to be prepared with a chair and a tent, but not the cheap ones as they are a nightmare to try and wrap back up The other apparent feature was the planting of your flag; looking around, you could see the many different contingencies, the Bajan, Lucian, Grenadian, Jamaican, Trini and many more. Everyone was repping their country and came prepared for the ultimate lime. In regards to the food, it had not started yet, but a number of people had gathered round the food marquee, looking like they were having heated exchanges. However, you really should know by now not to argue with a hungry belly. Nevertheless, the music was just starting up, the sun was starting to burst through, we smiled and went on to plot our spot. Once the music was set up, you just could not put the soca music on fast enough and feel that soca always works it magic by enthusing people to dance. For no matter the weather, we always will don our shorts and fete anywhere. 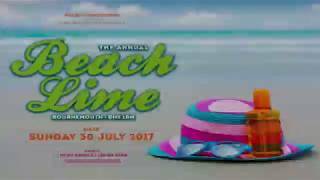 As people started to settle, so the liming began, with the latest tunes pumping from a selection of DJ’s and with a dance floor area created in the sand, on we flowed. …. but you just can’t kill a good family day out. Or can you? Quite what happened I am not sure, but the little bits of information I gathered, these were not the same caterers as the previous years. Previous years, saw a choice buffet selection of hot foods. This time around, we got a mound of plastic containers with pre-prepared food ready to heat up. I believe it was a chicken, pork or a fish choice. The fish option was actually presented similarly to a salmon wedge, with everything served with rice and peas. All with a little ‘itsy bitsy’ tub of salad to take away to add some colour and a different flavour to the plate! The food, unfortunately, was a little lacking in seasoning, the rice was served warm(ish) and the time spent to get it, really was not worth the wait. My friend had to have hers reheated a few times, to make it slightly more appealing. Coupled with the magnificent wait, it is with regret that I witnessed one of the biggest catering mistakes. The team used three (non industrial) microwaves, running each on small generators trying to warm each container of food for hundreds of people. I actually became embroiled in a heated discussion with one of the caterers. As I had bought my grandson and was waiting for food, but the queue had not gone down for 2.5hrs. It was at that point I wandered over to investigate the holdup and asked why. An obviously disgruntled caterer burst into a tyrant of back and forth arguments with me. All he kept saying was “do you have a generator”? After a few profanities and an intervention from one of the coach leaders, I stated what happened and my displeasure at the length of time waiting for food. He then took the time to kindly explain the situation, that he was not happy with the caterers, but there nothing that could be done now to fix it and had to just deal with it and try to ensure that all get fed. In the meantime reports of the quality of food were drifting in, so a few of us abandoned the idea to get food from the caterers and decided to pay and get a mighty fine oven wood fire cooked pizza, garlic bread with caramelised onions from a place further down the promenade. The promise of food with our ticket had been broken and disappointing. At 6.30pm, we were being told to get on the coach to leave to get back to London, however, we were delayed due to an altercation over seats on another coach. Since our coach driver was the most senior, he had to get off to tend to the fracas. With calmness resumed half hour later, we headed off. Wishing it was drama free, I drifted in out of sleep to heated conversations and occasional shouts of “I want to leave”. I finally awoke to someone screaming to let them off the coach and heading toward the door. He was thankfully stopped but it took over an hour to calm him down. In terms of the drama, let’s just say it was warranted as he was offended by coach staff; but fuelled by alcohol, his subsequent reactions did not help. At 10.30pm we arrived back safely at the Metronomes mas camp in Kensal Rise. I was sorry I had missed out on last year’s lime (2016), as I was told that everyone had a wicked time, but the weather just did not help this year, along with the issues with the food, but the people came, had a good time, drank nuff and we had wicked DJ’s playing tunes. Beach Lime set up pics! For those that have never been, it is just literally a big beach lime. It is set up along the beachfront, music is played, with drinks and food. You also do not have to take the coach, you can drive up there, but essentially, it is a place where you can just go, plot your spot, chill and enjoy the atmosphere, brave the sea, chill out with family and/or friends or dance to the many tunes played. It is not just Soca, music is played for everyone, with a mix of music played by top DJ’s. Previous Previous post: Vote for the best carnival! Next Next post: Trinidad – The master of ceremonies?